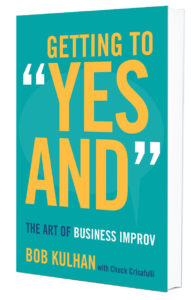 Myth One: Improvisation is Comedy - Getting to "Yes And"
Improvisation is in fact not comedy. Nor is it simply an approach to acting. Those are two specific types of improvisation, unique to the context in which the improvisation is taking place. There are many more contexts for improvisation, though. Improvisation is a key element of busy emergency rooms; it takes place on NBA basketball courts; it’s a part of the skill set for every policeman cruising the streets—all contexts in which comedy is certainly not intended to be part of the picture. The context dictates the style of improvisation required. The improvisation an emergency room doctor uses in performing a lifesaving operation is unique to that situation, and the kind of improvisation a starting point guard employs in facing an unexpected defensive strategy only makes sense on the basketball court. A fantastic example of high-level improvisation took place in 2011 when a team of highly trained U.S. Navy SEALs undertook Operation Neptune Spear—the deadly raid on Osama bin Laden’s compound in Pakistan. This mission had been meticulously planned; the SEALs trained for it over months and several contingency plans were developed and put into place. Still, when one of the navy’s Black Hawk helicopters crashed within the compound, a very specific kind of improvisation was required if the mission was to succeed under shifting circumstances. In this case improvisation had everything to do with adapting to changes within a strategy to achieve real, tangible outcomes. I certainly concede that the most common understanding of improvisation is as a form of comedy. Curb Your Enthusiasm, the aforementioned Whose Line Is It Anyway? and the films by Christopher Guest all showcase amazing comedic work that is based on improv. On a personal level I’ve been incredibly fortunate to spend an enormous part of my professional life on the great Chicago stages of The Second City, the Annoyance Theatre, and iO (where I was coached by Tina Fey and Amy Poehler and performed alongside such notable folks as Jack McBrayer, Ike Barinholtz, Thomas Middleditch, Jordan Klepper, Jason Sudeikis, and Seth Meyers along with many other famous and less famous, equally brilliant comedic improvisers). In that context we were performing with the focused purpose of delivering comedy. The payoff we were after was audience laughter and a great show. Laughter is not the payoff a surgeon, a jazz musician, or a SEAL team is after, though, and it’s certainly not the payoff a businessperson is looking for either. If you’re in front of the board of directors after a dip in fourth-quarter sales and you get thrown a hardball question, the challenge is not to quickly come up with a way you can use your necktie as a comedic prop to make the board laugh (lest that necktie become a noose with which you strangle your career). Instead you must react and adapt to the circumstances and communicate in an engaging and inspiring way. 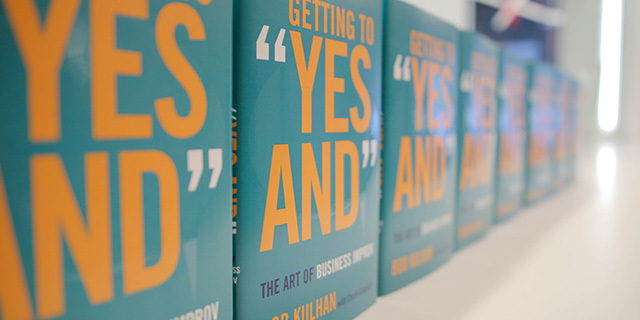 The takeaway here: improvisation as it applies to the business world is a specific type that works in the business context. The heart of this book is to explicitly demonstrate how the art of improvisation can be used as a serious means of getting serious results.